Seventeen years after the start of the first major U.S. war on terrorism – and tens of thousands of casualties and more than two trillion dollars later – the U.S. still lacks a credible database on international terrorism. There is no common official database at the interagency level, there are deep disagreements over the size and success of given threats, and there are major gaps in coverage. Each “war” on terrorism has its own approach (and usually approaches) to estimating the threat and to judging what parameters are important. There are a wide range of databases outside the U.S. government, ranging from commercial efforts to academic and NGO assessments. They often sharply disagree, and many are clearly political or ideological in character. The closest thing to an official database is the one used by the U.S. State Department in its Country Reports on Terrorism and its Annex of Statistical Information. 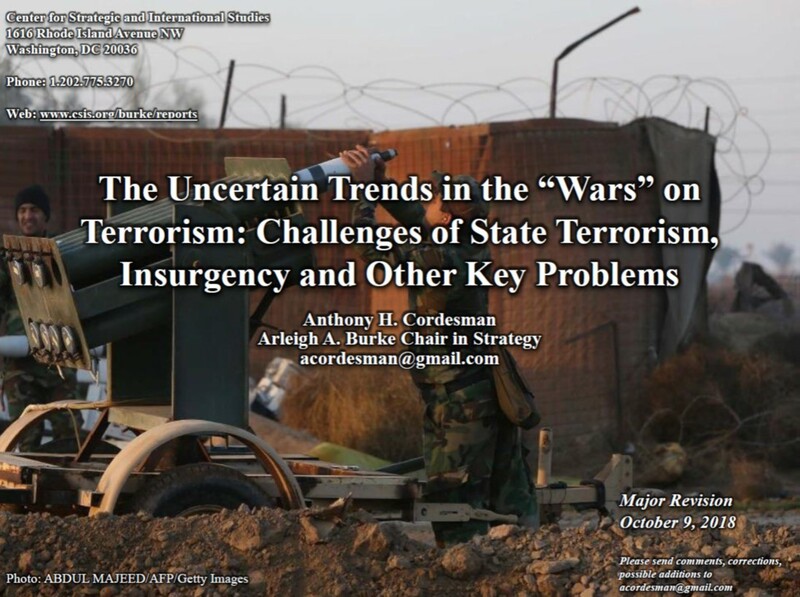 The report and annex provide an overview of the global trends in terrorism. 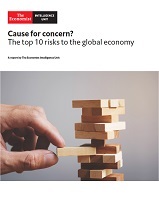 There has arguably never been a greater disconnect between the apparent strength of the global economy and the magnitude of geopolitical, financial and operational risks that organisations are facing. The Economist Intelligence Unit expects momentum in the global economy to remain strong in 2018. The US economy will continue to motor along, the euro area will absorb more of the slack in its labour markets and Chinese consumption, investment and exports will all remain strong. Higher commodity prices will prove a fillip for emerging-market exporters, while a gradual tightening of monetary conditions will not take hold to the extent that it slows growth. Taken together, these factors mean that the global economy is forecast to expand by 3% in 2018, up from a mediocre annual average pace of 2.6% in 2015-16. Despite the encouraging headline growth figures, the global economy is facing the highest level of risk in years. Indeed, this favourable economic picture appears to come from a completely different world to the one where headlines are dominated by protectionist rhetoric, major territorial disputes, terrorism, surging cyber-crime and even the threat of nuclear war. The global economy has seen periods of high risk before, with threats emanating from the regional and the national level, as well as from state and non-state actors. What is unique about this period of heightened risk, however, is that unlike other periods in recent decades, risks are also originating from the global level, as the US questions its role in the world and partially abdicates from its responsibilities. These moves have signalled the end of the US-led global order and the beginning of a new order. Although the new order will emerge over the next decade, there will be a period of uncertainty as multiple global and regional powers vie for power and influence. For organisations attempting to negotiate these concerns in order to take advantage of the numerous and growing economic opportunities, the stakes are obviously high. In this report we identify and assess the top ten risks to the global political and economic order. Each of the risks is not only outlined, but also rated in terms of its likelihood and its potential impact on the global economy. This is a small snapshot of our risk quantification capabilities. We also provide operational risk analysis on a country-by-country basis for 180 countries through our Risk Briefing. Meanwhile, we provide detailed credit risk assessments on 131 countries via our Country Risk Service. In a world increasingly shaped by unexpected events and developments – ranging from ‘strategic surprises’ like 9/11 or the Arab Spring to the unintended consequences of often well-meant decisions – trying to imagine contingencies that challenge current assumptions may well prove a useful exercise. This Report presents a number of grey swan scenarios which are designed to help decision-makers think about possible responses to crises and how they can be prevented. They cover a wide variety of geographical and operational situations while never explicitly calling into question specific EU actions or policies – only general EU principles and interests. Read more about What if ... Conceivable crises: unpredictable in 2017, unmanageable in 2020? Thinking about the future is vital but hard. Crises keep intruding, making it all but impossible to look beyond daily headlines to what lies over the horizon. In those circumstances, thinking “outside the box,” to use the cliché, too often loses out to keeping up with the inbox. That is why every four years the National Intelligence Council (NIC) undertakes a major assessment of the forces and choices shaping the world before us over the next two decades. Long-term thinking is critical to framing strategy. The Global Trends series pushes us to reexamine key assumptions, expectations, and uncertainties about the future. In a very messy and interconnected world, a longer perspective requires us to ask hard questions about which issues and choices will be most consequential in the decades ahead–even if they don’t necessarily generate the biggest headlines. A longer view also is essential because issues like terrorism, cyberattacks, biotechnology, and climate change invoke high stakes and will require sustained collaboration to address. Today the world faces a volatile convergence of instability, state weakness, and conflict. Lethal civil conflicts rage in Syria, Iraq, Afghanistan, Yemen, Libya, and South Sudan, stoking regional rivalries, offering safe havens to violent extremist groups, and triggering immense and unprecedented humanitarian crises. Even in regions and states where overt conflict is absent, such as West Africa or Central America, institutional and economic weakness creates unstable conditions that may enflame low level shocks or simmering criminal activity. At times resolution of these conditions may prove elusive and intervention fruitless; however, sometimes security challenges emerging in these environments require immediate and direct response. The United States must be prepared to operate in a range of complex environments to meet a range of security challenges and threats, such as humanitarian emergencies, terrorism and violent extremism, great power aggression, health security crises, and international criminal violence. This study focuses on these five functional security imperatives and illustrates each imperative through regionally or subnationally defined operating environments. In each case, the selected security imperative must be addressed in the near term to help meet other U.S. objectives. The goal of the case studies is to characterize the operating environment, identify key tasks and responsibilities to address the security imperative, and develop a set of tools and policy recommendations for operating in those specific environments. As we prepare to mark the 60th anniversary of the EU, we look back on a peace spanning seven decades and on an enlarged Union of 500 million citizens living in freedom in one of the world's most prosperous economies. At the same time, the EU has to look forward at how it will carve a vision for its own future at 27. 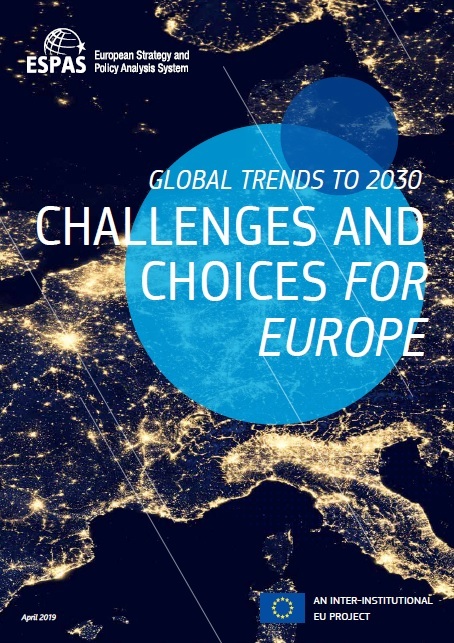 The White Paper sets out the main challenges and opportunities for Europe in the coming decade. It presents five scenarios for how the Union could evolve by 2025 depending on how it chooses to respond.